Project Location: Twelve (12) street segments and three (3) multi-use pathway segments throughout the City of Sonoma. Project Achievement: The project was a part of the City’s commitment to keeping the City’s streets and multi-use pathways in a safe and functional condition for multi-modal circulation. 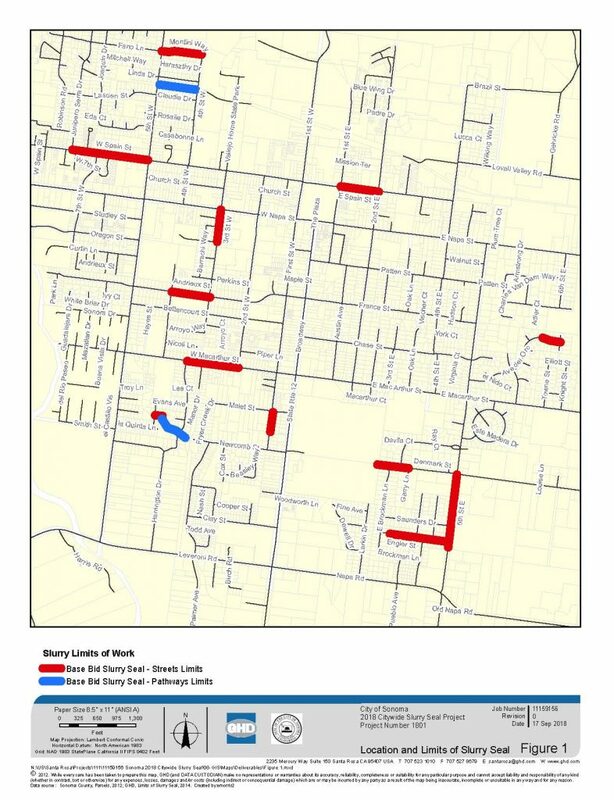 Project Description: The project generally involved street surface treatment (slurry seal) for up to twelve (12) streets and three (3) multi-use pathway segments throughout the City. Specifically, the improvements consisted of surface preparation; crack seal; removal and replacement of pavement striping and markings; protection of existing utility structures, curb and gutter, and cross gutter; traffic control; and other related work. NOTE: This project was funded with a combination of tax revenue generated from Senate Bill 1, the Road Repair and Accountability Act of 2017 and funding from the City’s General Fund.